By John C. Toman. Posted November 3, 2011, 7:25 AM. Following a brief bout of dry Santa Ana winds, a couple of storms should lead to rain and showers Thursday night and Friday, and again on Sunday. Friday's cold front is a classic example of the kind of storm we normally get in the winter, sweeping in from the northwest. 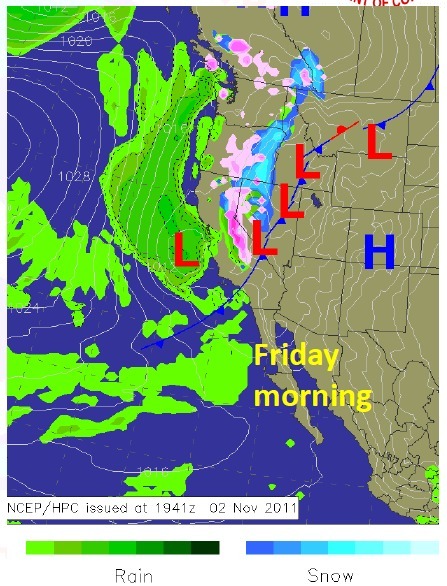 It may start with marine layer and drizzle or light rain, followed by scattered showers. The best chance of showers will be during the day on Friday. As temperatures fall on Friday, there's a slight chance of thunderstorms due to unstable air. Rainfall west of the mountains is currently forecast between a quarter to a half of an inch on Friday. Light snow is possible in higher elevations, and snow levels could fall to 5,500 feet in the wake of the front Friday afternoon and evening. Saturday will mark time between storms, then a weaker front is inbound Sunday.